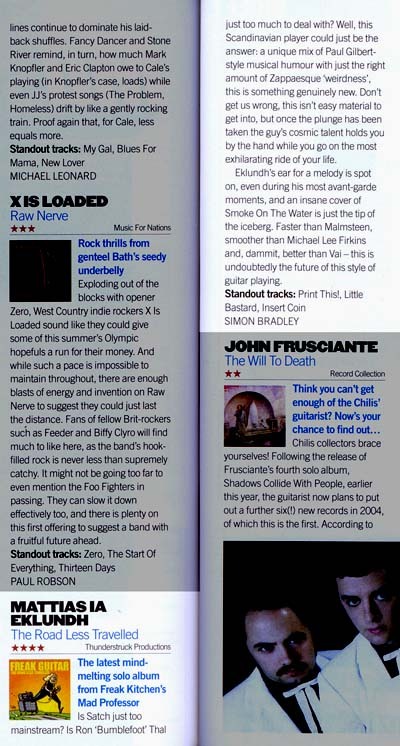 Superb review in Guitar One (US). Oh, how I wanted this album to be bad. I could taste the blood in my mouth just waiting to be spewed simply from the title. How I was expecting this disc to be a cheeseball trip back into hair metal land with no hope at all at getting even three stars from my heavily opinionated Musical Opinions. Even the album cover and PR sheet (“Slayer meets Steely Dan in a dark alley”) had me ready with the Et tu, Brute? knives. Oh, how I was sorely mistaken. Majorly. It seems that this Swede known as Mattias Eklundh knows how to make one helluva rockin’ disc. He knows how to play his guitar in ways that I’ve not peeped since Frank Zappa was alive, folks. Very technically astute yet willing to throw out the hooks and melodies to keep those of us around who aren’t into an album’s worth of guitar masturbation. Oh those wacky speed and hair metal licks are there, but Eklundh is the only guitarist I’ve ever heard to use both in an enjoyable fashion. That Steely Dan comparison is correct on the title track, which opens up the disc. Mechanical chain saw licks suddenly give way to a Becker and Fagen chord structure that makes one think Eklundh could be part of the Dan indeed if he was strictly playing Dan guitar. But since he isn’t, the juxtaposition is alarming, funny, and sophisticated. It works, what can I say? So I was sucked right into Freak Guitar from the start. But apart from that track, it’s hard to really put into words what Eklundh is doing here without listening to it yourself. Undoubtedly the grooviest thing on here is “Fletch Theme”. That’s right, a cover of Harold Faltermeyer’s them to the movie “Fletch”! How can I knock a guy for choosing that tune? I can’t. It was a left-field surprise that brought a smile to my face. There’s also a quite trippy run through of “Smoke on the Water” here that’s also worth listening to. Imagine that: a cover of that song that doesn’t make you want to hit the skip button. But the original material shines just as bright. “There’s No Money in Jazz” alternates speed freak licks with obtuse, Zappaesque melodies. “Father” is a beautiful semi-acoustic tribute to Eklundh’s deceased parent. “Caffeine” sounds like a cross between a Russian dance and a cartoon theme. And “Happy Hour” is an honest-to-God commercial pop song that would sound fantastic on the radio. Suffice it to say that there are plenty of surprises on this CD, all of them insanely pleasing. Even the album’s centerpiece, the nine-minute “The Woman in Seat 27A,” is so fluid and intoxicating that it hardly seems like a long song. Yet Eklundh has the chops to make all this work in a way that seems so easy. Probably the nice thing about the songs here is that plenty of them are under or around the two-minute mark. So you get a taste of what the guy can do before it becomes too much, and therefore it inevitably becomes addictive since he isn’t ever doing the same thing twice. There are 23 songs in all here, and frighteningly enough that almost doesn’t seem like it’s enough. Still, it’s nice to know that songs called “Ketchup is a Vegetable” and “White Trash Hyper Blues” live up to their imaginative names. 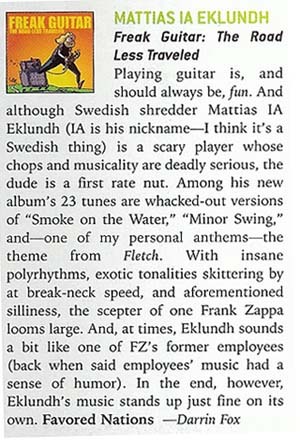 If Zappa were still alive and had a touring band, I have no doubt in my mind that Eklundh could be a part of it. We should all be happy that he’s not just another Steve Vai or Joe Satriani. That Eklundh has such imagination behind his playing is enough to highly recommend this disc. So get out there and score yourself a copy of Freak Guitar as well. I might have to start up a Mattias IA Eklundh Army if enough kiddies groove to this crazy sound. the mighty Guitar Player (US)! Mattias IA Eklundh, guitar wizard of the progressive rock/metal band Freak Kitchen, is also a guitar genius. His latest solo effort Freak Guitar: The Road Less Traveled, is a tour de force in guitar playing. Granted, this album is done solely for the purpose of showing that Eklundh can play. True, he overplays at nearly every opportunity. Those things said, though, this album is stunning. Very few players can make their guitars sound the way that he does. With 23 tracks, The Road Less Traveled is a bit of a hodge podge of musical genres. At times, there are thought provoking songs (The Woman in Seat 27A), and at times downright comical (One-String Improvisation). At no point, however, is there ever any doubt that this dude can play. The title track, also the first track on the album, prove that. The title tracks comes at you with one goal in mind…to blow you away. Achieving sounds that one would be hard pressed to reproduce, Eklundh creates a musical picture that begs to be repeated in your cd player. The song is strong enough to stand up against anything that Satriani, Vai, or Malmsteen have done. The only down side to this album is its number of tracks. 23 tracks is a lot to listen to and digest. Personally, when I listen to a cd, 12 tracks is about all I can handle. The Road Less Traveled does have the ability to lose the listener. But what a trip it is getting lost! Forget dynamite, the Celsius thermometer and the turbo car engine, Mattias IA Eklundh is the greatest thing to come out of Sweden and he returns with a 23-track solo release that features more of his patented Freak Guitar. Eklundh's greatest gift remains marrying over-the-top speed and pitch that never devolves into useless shred with memorable melodies and a thoroughly unique sense of humor — this is the man, remember, who once invited us to imagine what would happen if Django Reinhardt had covered KISS's "Detroit Rock City." His appreciation of the classics doesn't seem to have wavered as on The Road Less Traveled he pauses to pay homage to Harold Faltermeyer with a cover of the theme from Fletch and Deep Purple with an instrumental take on the rock song to end all rock songs "Smoke On The Water." But it's his own frequently quirky and sometimes poignant compositions that come to the fore here, whether "Happy Hour" (in which he takes a rare vocal turn and demonstrates that he's a stronger vocalist than most six-string slingers) or the elegantly contemplative ballad "Father." Eklundh fills both "Chopstick Boogie" and "Samba Caramba" with side-splitting, eyebrow-raising goodness that will please guitarists and non-guitarists alike but also finds time to stimulate his audience's musical intellect with intriguing vignettes such as "Toxic Donald," "Toxic Mickey" and "One-String Improvisation," before launching into the orchestrallike "Asteroid 3834." Eklundh may never experience the Top 40 success of Eddie Van Halen or find his face spread across as many magazine covers as label boss Steve Vai but he's certainly a voice as important and gifted as either in the world of guitar. If you haven't heard of Mattias "Freak Guitar" Eklundh, you are missing out on some of the best guitar-centric music on the planet. Unreal sounds pour forth in a frothy, frantic, bubbling stew of sound guaranteed to stun you at every turn. The new release, "Freak Guitar - The Road Less Traveled" (Favored Nations, 2005) is no exception. In fact, it may well be his best work yet. Opening with the quirky but beautiful title track and sliding right into the bizarre "There's No Money in Jazz", Mattias wastes no time drawing the line. "Father", a gorgeous piece of nylon string work lilting over a rough, techno edge full of moody modulations & stylistic shifts, while "No Strings Attached" is a brief, crushing attack on the senses, and "Caffeine" is a hyper-kinetic carnival ride with speedy, fleet-fingered sorties into FreakLand. Other highlights include an amazingly original version of Deep Purple's "Smoke on the Water", the uber-flanged speed riffed "Chopstick Boogie", the reflective "The Woman in Seat 27A", and the wicked licks & oral percussion of "Samba Caramba". If you lke your humor dark, your roller-coasters scary, and your guitar playing insane, then "Freak Guitar - The Road Less Traveled" is for you. Bottom line: 10 on the Reichter Scale; an essential part of any collection of serious guitar music. Don't get it today - get it NOW! 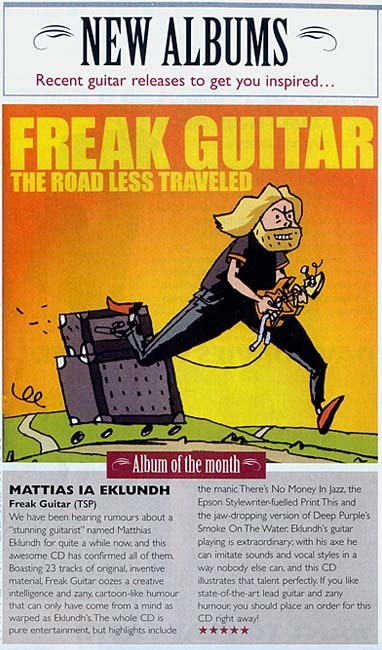 From Favored Nations comes Freak Guitar – The Road Less Traveled, Mattias “IA” Eklundh’s latest solo outing. If you recognize Eklundh’s name, you may be familiar with his permanent day gig as the lead guitarist/vocalist for Freak Kitchen, the rocking Swedish trio that has released their sixth album Organic in 2005. Where Freak Kitchen is primarily a Metal band that explores many layers of music, Eklundh’s solo recordings are boundless in their musical diversity. As vocalist for Freak Kitchen, Eklundh sets himself apart from other vocalists with his very straightforward, matter-of-fact kind of storytelling, ignoring the rules of melody and rhyme scheme. But as guitarist, Eklundh, better known as “IA,” is setting the world on its ear with his exploratory guitar voicing. More than just flashy, mile-a-minute notes played with ultimate precision and a flare of dynamic melody, IA is taking the guitar where no Axe has gone before. The noises, the squawks, the shrieks ... they become alive and manifest themselves into tunes of substance and groove. During IA’s cover of Deep Purple’s “Smoke on the Water,” the listener will be floored by the maniacal take of this well-worn Rock standard. There is a little something for everyone on this disc. Daring to go far beyond his Rock roots, IA embraces a cross pollination of Electronica with a dose of Fusion and some modern Pop accents. The beautiful “Father” is touching and profound with its haunting melody, and could easily fit within the confines of today’s AOR play lists. The quirky “Fletch Theme,” yes from the movie Fletch, starring Chevy Chase, feels right at home amongst this eclectic setting of musical genius. His playing is truly inventive; Mattias Ia Eklundh plays with the shredding gusto of Steve Vai, the avant-garde approach of Zappa and technical mindset of axemen like Steve Howe and Steve Hackett. However, Mattias Ia Eklundh is truly in a class by himself. His latest release is appropriately titled since few musicians have conquered the musical composition and guitar playing shown on this disc. There are many different styles that Eklundh incorporates into Freak Guitar -- The Road Less Traveled; not just with his playing, but also with the production and the diversity in the guitars he uses and sounds he achieves that really come full circle within the songs, making Eklundth to be extremely versatile. Freak Guitar -- The Road Less Traveled jumps between the jazzy connotations (title track), metal flamenco ("Caffeine"), emotional balladry ("Father"), electronic experimentation ("Chopstick Boogie" and "Insert Coin"), funk toying ("Samba Carumba") and even covers of "Smoke on the Water" and the "Theme from Fletch." Eklundth truly puts the expression of six-string slinging in places that so many people have tried, but have yet to accomplish, making him a renaissance guitar man. Complimented with different engineering techniques, with hard panning as well as the layering of effects and other melodic noises, the sound of the record is enhanced to the "experience" level. This makes Freak Guitar -- The Road Less Traveled more than just any record of experimental metal fusion; it is proof that Eklundth is one of the few guitarist to come around in a long time to really stamp their own style onto their music.